In this blog, we share with you the best collection of Hindi riddles with answers. These riddles in Hindi are not just for kids, but can be enjoyed equally by adults as well. You will find these collections of Hindi riddles (हिंदी पहेलियाँ) to be a mixture of easy riddles, funny riddles as well as hard riddles. We believe that best riddles are those that pose questions that make you think. To Skip the detailed description of this article and to read the article in Hindi Click here. Woh baandh galay mein soot. Riddles can pose questions that can make you think! If you already know the answer, pat yourself on your back and read further. In case you don’t, take a few minutes of your time and try and guess the answer. We will disclose the answer to this Hindi riddle at the end of this blog, so read on anyway. While my mother hardly expected me to come up with the correct answer in my very first attempt, her intention was to make me think. In that sense, Hindi riddles (हिंदी पहेलियाँ) are like our own Indian version of brain teasers. All through my childhood, from toddlerhood to well into adolescence, riddles and wordplay was an important and integral part of our lives. Just a generation ago, riddles were commonly posed by adults to children and were looked upon as a way of educating and engaging children. Riddles are filled with great sense of humour, metaphors, similes, exaggerations of size, shape and function and many other leaps of creative imagination that make the experience delightful and funny. Just as riddles in Hindi language are popular as “Bujho to Jaane (बूझो तोजाने)” oral play, other Indian languages like Marathi, Bengali, Tamil, Telegu etc. also have a rich history of riddles. Riddling in India: Are we losing our Culture? However, riddles have steadily been marginalized from young children’s lives, due to various reasons like the overwhelming presence of electronic gadgets, increase in nuclear families, lesser involvement of grandparents and misconceptions that riddles are ‘childish’ in nature and that their primary role is only to entertain. One other important reason is that oral traditions such as riddling did not have proper record-keeping in India, like books or other forms of printed media, and therefore are gradually getting lost. In this blog, we look at the historic importance of these brain teasers for kids and its association with Indian culture. We try to understand their nature and their different forms, before delving into the benefits that they have on childhood and their lasting impact on adulthood. We also analyze the importance of riddling in early age learning and education. We finally end the blog with an amazing collection of 60 Hindi riddles for kids with answers, that you will enjoy immensely. Riddles have been an integral form of the rich Indian oral tradition. Whether it be a riddle contest between Yudhishthira and a Yaksha, in the Hindu epic ‘Mahabharata’ (where Yudhishthira had to answer all the riddles of Yaksha in order to save his family) or the ‘Baital Pachisi’ in which each time King Vikramaditya tries to capture the Vetala, it tells him a story that ends with a riddle. What are Riddles? And what are the different types of Riddles? Can you think of an answer to the riddle in gif? An enigma is a problem in which the solution is expressed metaphorically. You must carefully think about the riddle to come up with the solution. A conundrum is a question that opens either the question or the answer. Riddles in Hindi, however, doesn’t always need to be classified as one of these two types. You will understand this as you work your way through the best collection of Hindi riddles that we have for you at the end of the blog. Riddling as Oral Play: Why do children find them interesting? Since the beginning of language, riddles have been enjoyed. Why? Because we love to ask questions and find answers. We first ask the question “Why?”, when we are two years old, and we don’t stop asking the same question for the rest of our lives. Asking questions and finding answers is one of the best ways to gain knowledge. First, riddles appeal to children because they provide an opportunity to experiment with language in unexpected or unusual ways. When presented with riddles, listeners carefully search for clues that help solve the mystery and they feel a sense of accomplishment when the answer is discovered. Even when they are unable to answer the riddle and finally are provided with the solution, their enthusiasm is not diminished. These thought-provoking opportunities are seen by children as a form of play. Secondly, as it is a competitive play that involves a win-lose interaction between two or more children, riddling fosters a sense of healthy competition. Thus, the ability to say and interpret many riddles positions a child as knowledgeable among her peer members and boosts its fragile ego. Even when done alone, say only between a parent and a child, the sense of healthy competition is still present. Third, in the context of riddling between their peer group, children have autonomy in controlling and leading their interactions and play activities. How does Riddling benefit Children? Storytelling and riddling embody children’s play culture and knowledge of how to interpret the social environment as well as information sharing. These forms of children’s oral tradition constitute children’s local knowledge that involves memory and skill of telling and interpreting as well as awareness of values related to it. Thus, observation and appropriation in the process of oral tradition and the combined social practices enhance children’s learning from three angles: cognitive, social and cultural. Through producing and reproducing oral tradition, children develop their social networks with each other as well as with adults, and this process helps them acquire skills of communication. Again, through such oral processes, children make sense of the values and norms embodied in customary practices and further develop their cultural competence. Riddling for Children: An Important tool for language and cognitive development? The practices of creating and interpreting folktales and riddles require children to exercise their mental processes such as thinking, associating, reciting and imagining. This process enhances children’s cognitive learning and development. Note: Very technically, there can be multiple answers to the above riddle. But this riddle introduces an important concept to children: that even non-physical (and abstract) entities can be measured. To solve this English riddle, carefully analyze the thinking that occurred. You probably made some guesses based on your own background knowledge, then narrow down on your choice of possibilities. You might have considered all the ways and things we measure — for example, with rulers, thermometers, scales and height, weight and volume. If you had read or heard this riddle before, you probably searched your memory for the answer. Perhaps you tried mentally to picture the riddle before you came up with an answer. All in all, you were using your critical and creative thinking skills to decipher this riddle. The inclusion of oral tradition in the formal learning process enables children to connect their local knowledge to their lessons in the classroom and contextualize their learning process in which they enhance the authenticity of their learning activities. Humour has a proven impact on enhancing the learning environment, provides children with an incentive to read, and also promotes critical thinking skills as well as vocabulary and language development. Furthermore, children are good at combining their oral play practice with their work, school, peer relationships and family interactions. Through such processes, children use oral tradition as a context of learning, play and cultural reproduction, as well as intra-generational and inter-generational interaction. In school, for instance, children are motivated to learn and can easily find meaning when they understand their lessons through their own life experience and everyday practices which they articulate by performance and interpretation of oral tradition. Riddling has immense social and educational value for children as it creates a context in which they entertain one another through testing each other and which also sustains their social networks. Riddling exposes children not only to the realm of play but also to situations that enhance their problem-solving skills and the ability to interpret metaphorical images by associating them with social and natural phenomena. Riddles thus provide children with contexts in which they experiment with language and solve problems. It enables them to develop their memory and interpretative skills through their own play activities. As children acquire and recall many riddles and interpret their meanings in association with social and natural phenomena, they steadily extend the scope of their intellectual awareness. Thus, riddling epitomizes child-friendly play, providing informal learning situations through which children reconstruct their social practices, exercise their intellects and acquire knowledge about realities in their environment. We understand that some of you might be keen on finding the answer of the Hindi riddle we posed at the beginning of the blog. Thank you for being patient! The answer is “Patang” (Kite). What do you think is the answer to the question posed in the second riddle in Hindi? Please provide your answer in the comments section below. 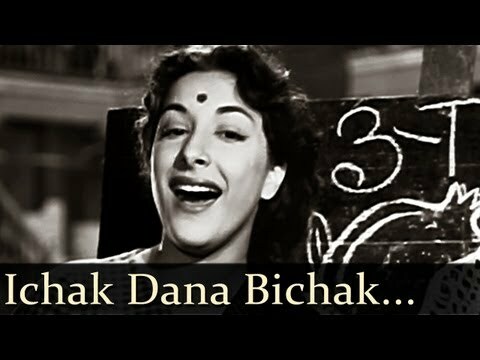 Check out this famous classic song from the movie “Shree 420” on riddles in Hindi! It will take you to your childhood days! Finally, we have compiled a list of most popular, nostalgia-evoking and interesting Hindi riddles for kids with answers, which you will surely enjoy. Use these riddles in Hindi to engage in oral-play with your kids. In case we have missed any good ones, we (and our readers) would be very thankful if you add them to the comments section below. We hope you enjoyed our collection of the best Hindi riddles for kids with answers! Super cool , post. Loved it.